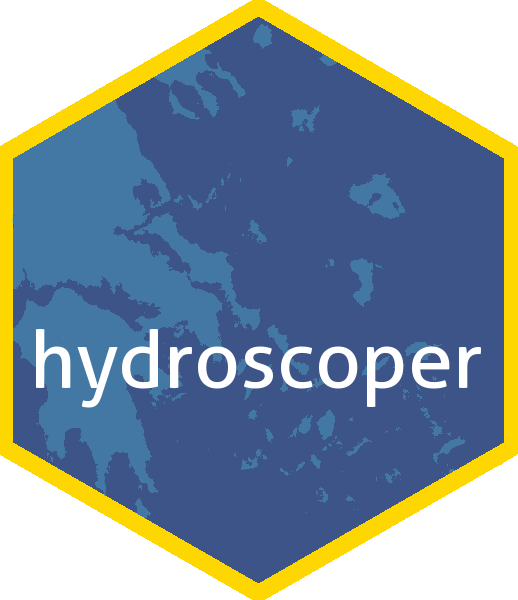 An introduction to hydroscoper with details about the Hydroscope project and the package. Using hydroscoper’s data sets with a simple example of how to use the package’s internal data sets. get_stations, get_timeseries, ..., etc. family functions, to retrieve tibbles with Hydroscope’s data for a given data source. get_data, to retrieve a tibble with time series’ values. hydro_coords, to convert Hydroscope’s points’ raw format to a tibble. hydro_translate to translate various terms and names from Greek to English. stations a tibble with stations’ data from Hydroscope. timeseries a tibble with time series’ data from Hydroscope. greece_borders a tibble with the borders of Greece. This is a minimal example which shows how to get the station’s 200200 precipitation time series 56 from the kyy sub-domain. Bug reports, suggestions, and code are welcome. Please see Contributing. All code is licensed MIT. All data are from the public data sources in http://www.hydroscope.gr/.